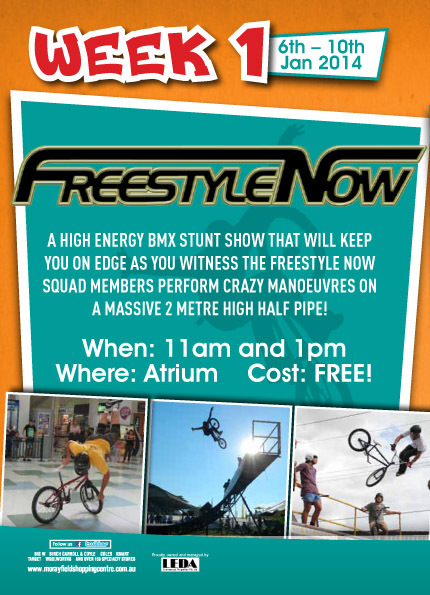 The Freestyle Now bmx stunt squad will be taking control of the Atrium at the Morayfield Shopping Centre, Morayfield, Queensland next week, 6th to the 10th of January, with what can only be described as controlled chaos. The high energy halfpipe and flatland show performances will keep the crowds on edge as they witness the Freestyle Now squad members perform some amazing bmx stunts. Freestyle now squad members David Pinelli and Shaun Jarvis will be joined by Colony riders Alex Hiam and Chris Courtenay who all will be ready to roll out the radical riding and entertain the masses. Make sure you head on into the Morayfield shopping centre this January to check out the Freestyle Now bmx stunt shows.